Ask Dr. Universe: Why do stink bugs stink? Fri., June 15, 2018, 9:55 a.m.
You’re right, stink bugs give off quite a stink. To find out exactly what that smell is all about, I visited my friend Elizabeth Beers. She’s a researcher at Washington State University who works with insects, including a kind of stink bug. You may remember smells are really just a combination of elements. An eggy smell, for example, often comes from a combination of two elements, hydrogen and sulfur. These elements come together to form a compound. A stink bug releases its own compounds from a small gland located on the middle section of its body, or the thorax. Different kinds of stink bugs may give off different smells as they release different compounds into the air. Each person’s nose may pick up on the smell in a slightly different way, but most people agree the smell is pretty unpleasant. Adult stink bugs don’t have many predators, in part because of their size and their smell. They can be attacked by spiders, praying mantises and assassin bugs. The smelly compounds are a defense mechanism, Beers adds. Even if the stink bug might actually taste good to another bug, the predator just can’t get past the smell and may leave its prey alone. In the U.S., we have more than 200 different species of stink bugs crawling around. Some of them made their way here from other countries. We call them an invasive species. 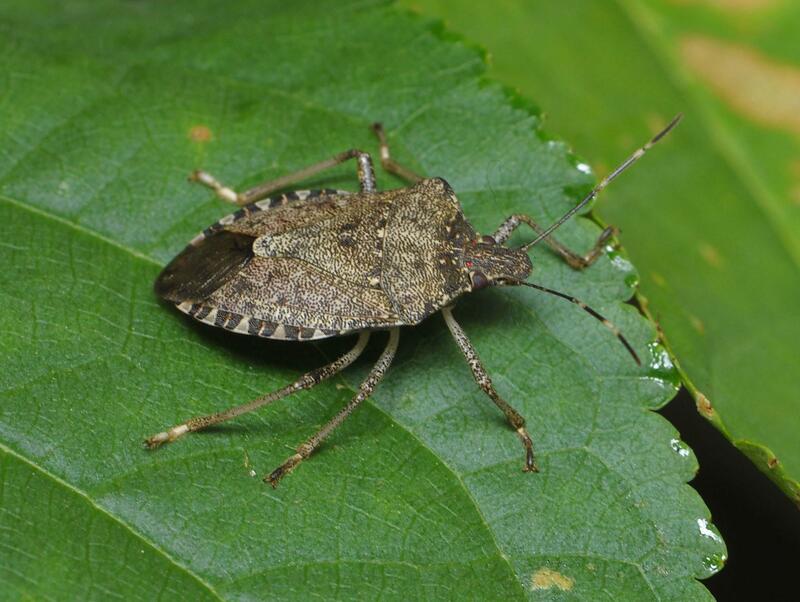 One invasive stink bug that has moved into Washington state is the brown marmorated stink bug. Recently, Washingtonians were starting to see a lot of these in their houses and yards. This species is reported to smell a bit like cilantro. Beers and her fellow scientists at WSU got a lot of messages about the stink bug sightings – and the reports continue to pour in, she says. The bugs pose a challenge for farmers. We grow a lot of fruit trees in Washington state, like apples pears and cherries. But stink bugs can be a real pest. They stick their long tube-like proboscis down into the fruit and damage it. Beers and friends at WSU are working on ways to help manage stink bugs so farmers can keep growing delicious, healthy fruit. In Washington state, stink bug sightings can be reported to our researchers. You can identify a brown marmorated stink bug by its six legs, two antennae with white stripes, and its shield-shaped body. After finding one, snap a photo and include it in an email with your name, the date you found it, and where you found it. You can send your findings to tfrec.reportbmsb@wsu.edu. Have fun practicing your stink bug sleuthing skills, citizen scientists. Published: June 15, 2018, 9:55 a.m.